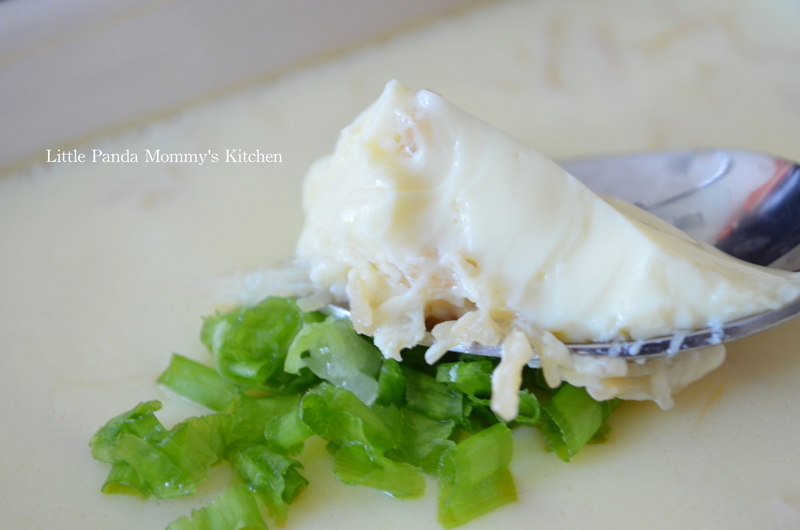 Steamed eggs is a very common homemade dish for Chinese, most mom and kids love it because it is nutritious and delicious. Dried Scallops are very flavorful and good for your body. It contains lot of protein, vitamin A, vitamin B and vitamin D. Chinese usually serve dried scallops congee to patients to help them recovery faster. Adding it into the steamed eggs, made the dish so rich in flavor with just a touch of salt. 1. In a small bowl, add hot water to cover dried scallops, soak for at least 2 hours or until soften. Shred dried scallops and set soaking water aside for later use. 2. Whisk eggs, water, soaking water and salt until well combined, strain through a strainer into the baking dish. Add shredded dried scallops and stir well, cover baking dish with plastic wrap. 3. Pick “steam” function, set to 210F for 20 minutes, sprinkles with green onion and serve immediately. Bring 1 inch of water to a boil in a big pot or wok, place a metal rack and set the baking dish on it. Cover the lid, lower heat to medium and cook for 3 minutes. Heat off and remain covered for 2 minutes. Remove lid quickly, sprinkle green onion and serve immediately. 2. Eggs and water ratio is 1 : 1.5 , adjust steam time accordingly. 3. Each stove and cookware are different, use glass lid if available. Pay close attention to eggs color, turn heat off immediately when eggs turn light yellow, let it covered for 1-2 minutes and serve at once. This entry was posted in Asian Recipes, Chinese Food, cook in 15 minutes 15分鐘開餐, Cuisinart CSO-300 Steam Oven Recipes, Easy Cooking, Healthy Eat, Hong Kong Style Recipes, Le Creuset Recipe, Recipes and tagged baking dish, Scallops, Steamed eggs on February 28, 2014 by littlepandamommy.